It all started with a pair of great boots. Now you shoe and boot people will know exactly what I mean. You see a great pair of boots, you get them, and then you realize that you’ve got to have a coat to go with the boots . . .And a matching bag. It could get nutty. And I find myself even fantasizing a new Medallion Travel Bag, or a new bag altogether. The possibilities know no bounds and I’ve been doing a lot of wishful for knitting time thinking. Ah, the things I could do! But the boots. Even strangers in airports (I’ve seen a lot of airports lately) notice and comment on these boots. 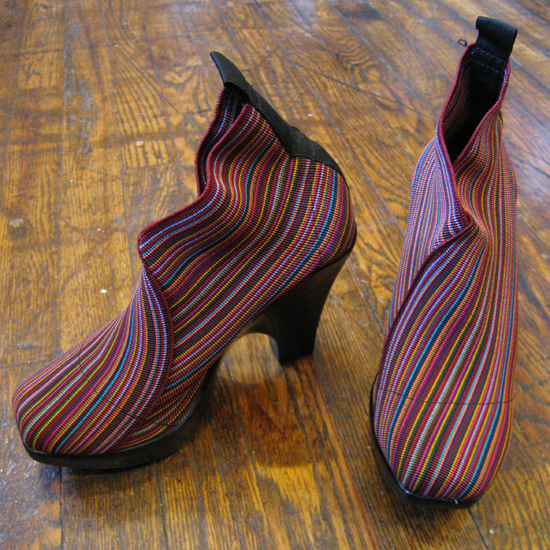 These boot do not look so great with my blue-striped Ella . . . See for yourself. Love the boots. Love the coat. Together, not so much. So, I began to devise my plan for a new Ella. It was the beginning of October, just starting to be knitted coat weather, and I was going on a 1-week/4-shop teaching tour of California. Perfect knitting time. Long plane ride, late nights knitting in Best Westerns accompanied by the sort of TV I never otherwise watch: Say Yes to the Dress. I can’t adequately explain why I love this show so much when I am away teaching. Maybe because it’s perfect knitting television: not too boring, not too interesting, not too emotional, not gory and sad like true crime . . . it’s strangely neutral but nicely plot driven. As I packed for the trip, I started grabbing balls of yarn left over from all the flower knitting I did last Fall (more about this soon. . .). I chose mostly Stonehedge Fiber Mill’s Shepherd’s Wool for it’s divine softness and the beautiful color palette. I added a few bits of Tilli Tomas Flurries in Plum, Atlantic, and Rasperry. I had some odd skeins of the now sadly discontinued Tilli Tomas Whistler in Ruby Wine. I chose a delicious melange: Red, Christmas Red, Garnet, Berries, Orange, Hot Pink, Zinnia Pink, Antique Rose, Raspberry, Violet, Blue, Turquoise, Purple, a tiny bit of Lakeshore, some Lime (one stripe), and some Spring Green (two rows). The picture below is the balls in my Medallion after most of the knitting was done. Imagine this bag full to bursting. I stuffed it ruthlessly under the seat in front of me on the plane. The coat got bigger, the balls got smaller. 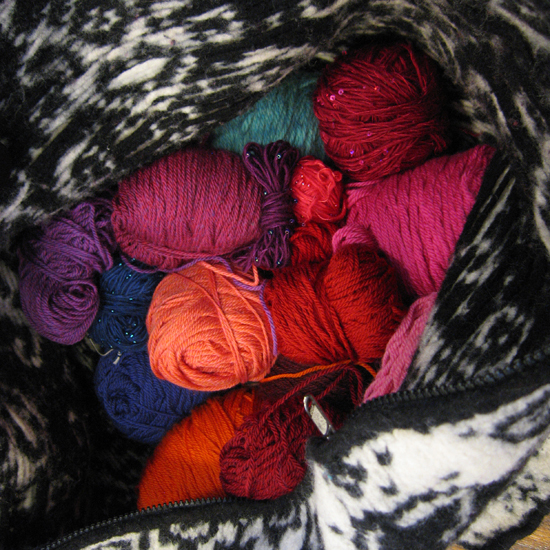 The Medallion Travel Bag with my assortment of colors (much reduced from the pile with which I started). I knew I wanted the coat to be long and that I wanted to continue the A-line shaping as far as possible, but I didn’t want to figure out all that math ahead of time. And what if I wanted it still longer after all that knitting? So, I decided to start with the bodice instead of the bottom. That would remain unchanged. So, I cast on the stitches for the bodice at the point in the pattern where you would normally bind off the stitches for the skirt, transferring markers to stitches, and then pick up those same stitches, transferring the markers back to their rightful places. All I needed to figure out was where to place the markers for the bodice shaping. Not difficult at all! I will include the details of my pattern tweaks in a separate entry entitled, unceremoniously, My Ella Coat Pattern Tweaks Unveiled. Warning: they will mean little if you don’t already have the pattern. If you do have the pattern, I will orient you to the right locations and it will all be clear. If not, comment on the post and I’ll get you all sorted. The bodice went quickly and it was almost as satisfying as a top-down garment. I could try it on and see it fit. By starting with the bodice and then picking up stitches to knit the skirt of the coat down, I didn’t have to worry about finished length, about the ruffle at the bottom . . . I could just enjoy the process of striping (never has stockinette been so much fun! I tell you, I loved every minute of it because I didn’t chart out the stripes. I striped as the fancy struck me, so there are similarities in the patterns that arose, but no pattern is repeated. I kept trying it on with my crazy boots until the length seemed just right. . . It will be Thanksgiving tomorrow and I had had a hope I could wear it to the feast, but, alas, the sleeves are only just finished and not yet seamed, so perhaps late in the evening tomorrow I will have time to weave in some ends, seam those sleeves using the tails of like colors for a prettier seam, and then set them in. It will be ready for its maiden voyage next week. For more about this project, look for my posts (coming very shortly) about An Argument for More Ruffles! and My Ella Coat Pattern Tweaks Unveiled . . . I designed the Ella Coat for Women during the Summer of 2008 for Fall 08 release. I made the coats in my own size but didn’t wear them for a few reasons. They were in demand for trunk shows. They spent a lot of time on mannequins . . . until this Fall. I started wearing them. 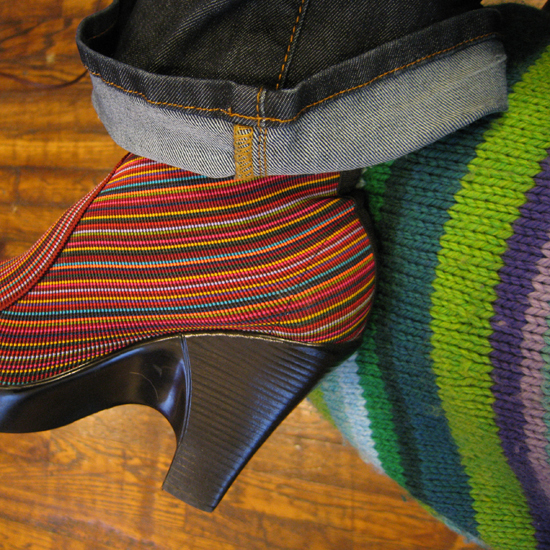 One is striped, cool colors–it’s the coat featured on the inside of the pattern. It is made in Shepherd’s Wool and so soft I can wear a short-sleeved t-shirt underneath. The other is turquoise Lorna’s Laces kettle-dyed superwash merino. Also delicious. I love these coats. In fact, I have to force myself, as the days grow cooler, NOT to wear one of them each day. I fear I will wear them out too too fast. But they are swingy, with A-line shaping. The front is ruffled on one side and appeals to my love of froof. So, I’ve been working on another coat. I mean, I’ve got lots of plans for this pattern. I want one in every color with all sorts of innovations. But for now, I’ve settled for working stripes off pattern, making the coat long, AND ruffling both sides of the front . . . all the way down. I am at the studio as I write and the coat I am working on (almost done! working on the sleeves in the evenings!) is at home, so I will post more later with pictures included. But let me say this: everywhere I go people love this coat. On a recent teaching tour to California (perfect Ella coat weather, I might add) lots of the workshop attendees tried on one of the other of my coats, all of their bodies different than mine, some ladies a little larger, some a little smaller. I am not the least embellishing when I say the coats looked good on everyone. If your body is a little rectangular, it looks great, the shaping adds shape and flare, some romance. If you are a little more spanish guitar shaped, the A-line skims over hips in a flattering way. A little broad in the shoulders? The ruffled hem creates balance. Don’t care for the striped effect? Make it solid, or just stripe at the hem and cuffs for a unique detail. Tall? Make it LONG. Smallish? I’m only 5 foot 2 early in the morning so I like to wear platforms to give me a little extra stature, but short or longer, the Ella coat is such a lovely shape it works. The smallest size fits a 32″ bust, the largest a 52″ bust. . . so there is a size for just about everyone. Knit along with me. . . more shortly with what I tweaked and how you can do what I have done, or just follow the pattern as written.